Häggite: Mineral information, data and localities. For synthetic häggite, Wu et al. (2009) suggest the formula V4O6(OH)4. Named by H.T. Evans, Jr. and Mary E. Rose in 1958 in honor of Gunnar Hägg (14 December 1903, Stockholm, Sweden - 28 May 1986), chemist, crystallographer and professor of General and Inorganic Chemistry at the University of Uppsala, Sweden. This page provides mineralogical data about Häggite. Graph shows reflectance levels at different wavelengths (in nm). Top of box is 100%. Peak reflectance is 15.6-11.9%. Calcite 5 photos of Häggite associated with Calcite on mindat.org. Tyuyamunite 5 photos of Häggite associated with Tyuyamunite on mindat.org. 4.HE.20 Bariandite Al0.6(V5+,V4+)8O20 · 9H2O Mon. 4.HE.20 Bokite (Al,Fe3+)1.3(V5+,V4+,Fe3+)8O20 · 7.4H2O Mon. 4.HE.20 Corvusite (Na,K,Ca,Mg)2(V5+,V4+,Fe2+)8O20 · 6-10H2O Mon. 4.HE.20 Straczekite (Ca,K,Ba)(V5+,V4+)8O20 · 3H2O Mon. Evans, H.T., Mrose, M.E. (1958) The crystal structures of three new vanadium oxide minerals. Acta Crystallographica: 11: 56-58. Fleischer, M. (1958) New mineral names. American Mineralogist: 43: 378-387. Evans, H.T., Mrose, M.E. (1960) A crystal chemistry study of the vanadium oxide minerals, häggite and doloresite. American Mineralogist: 45: 1144-1166. Ryabeva, E.G., Dubakina, L.S., Gorshkov, A.A., Nekrasova, Z.Z., Taichkova, L.I., Khruleva, T.A. (1978) Häggite - new data. Doklady Akademii Nauk SSSR: 243: 1295-1297. Fleischer, M., Pabst, A., Mandarino, J.A. (1980) New mineral names. 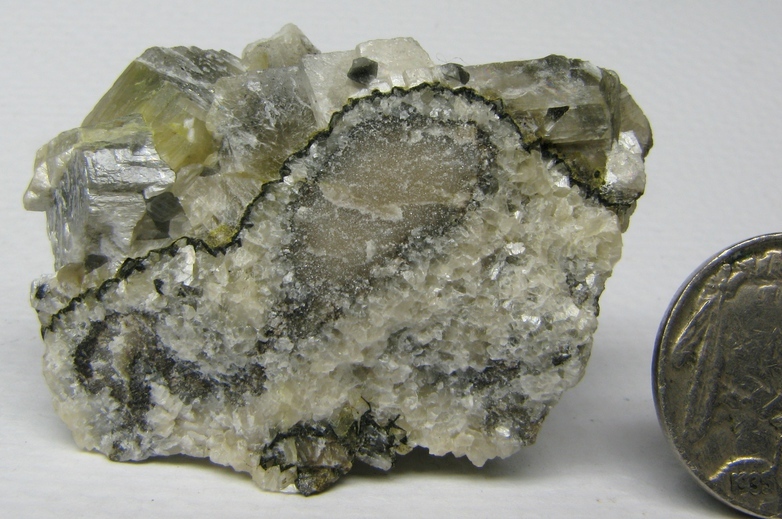 American Mineralogist: 65: 205-210. Wu, C., Dai, J., Zhang, X., Yang, J., Xie, Y. (2009) Synthetic häggite V4O6(OH)4 nanobelts: Oxyhydroxide as a new catalog of smart electrical switch materials. Journal of the American Chemical Society: 131: 7218–7219. 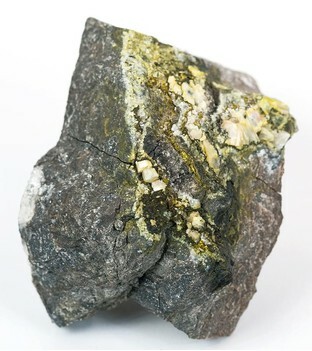 Callegari, A.M., Boiocchi, M. (2015) Häggite from the Gambatesa mine, liguria, Italy: a refinement of the crystal structure. Neues Jahrbuch für Mineralogie, Abhandlungen: 192: 33-38. Balestra, C., Bracco, R., Armellino, G., Leporatti, C., Callegari, A.M., Boiocchi, M., Costa, E., Ciriotti, M.E. 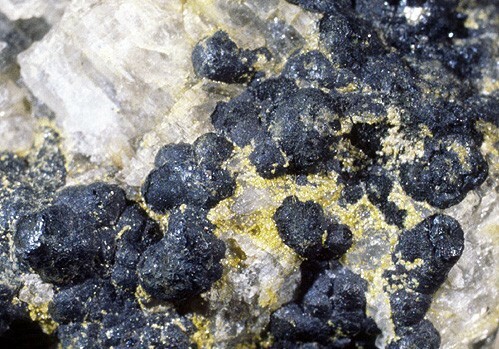 (2012): Aggiornamenti di mineralogia sistematica ligure. Nuove specie della Val Graveglia. Micro 2/2012, 56-65.